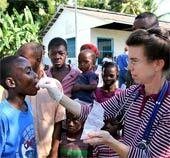 Aid worker administers medicine to Haitian child in Léogâne.With the current wave of natural disasters and international conflicts extant in the world today, the number of people engaged in global humanitarian relief, including medicine, is growing. As a result, there have arisen special concerns for providing medical care and other types of assistance during humanitarian efforts. At the Wilderness Society summer annual meeting in 2010, Cindy Bitter, MD, led a round table discussion entitled “Challenges and Controversies in Humanitarian Medicine.” I will use materials she prepared for the syllabus to offer some observations about the general topic of humanitarian medicine, which is very often practiced in outdoor settings that are austere. 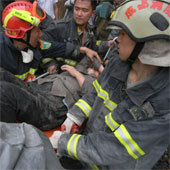 This post, Challenges In Humanitarian Medical Care, was originally published on Healthine.com by Paul Auerbach, M.D.. This story resonated with me because lately I’ve been hearing a lot about a new book, No Way Down, which was featured on NPR along with some other mountain disaster books. No Way Down covered the story of several teams of mountain climbers who were stranded on K2 when an icefall cut their ropes. Most of the climbers died although a few managed to pick their way back to base camp. Survival stories have always been popular. Entire television series now feature teams of people pitted against one another to overcome some test or challenge. Disaster movies were popular back in the ’70s, when the Towering Inferno, Airport and the Poseidon Adventure let us watch people get picked off one by one.